PBS LearningMedia, which provides digital learning experiences for students, recently conducted a study that goes beyond looking at the impact of technology on students' ability to fill bubbles in old-fashioned tests. Instead, it showed the positive impact of educational media on student achievement. 1) High quality digital content positively impacted student content knowledge and critical thinking practices when integrated into existing curriculum. Across subject areas (English language arts, mathematics, science and social studies), student performance on content assessments showed significant improvement, increasing by eight percentage points. 2) On average, students outperformed national assessment norms by 10 percentage points, and students also outperformed state assessment norms, by an average of 11 percentage points. 3) More than half (56 percent) of students also showed an increase in the frequency with which they engaged in critical thinking practices. 4) Teachers overwhelmingly reported that PBS LearningMedia made positive contributions to their classroom practices, with many saying they are more likely to integrate digital media into their lessons. The study was conducted by Education Development Center’s Center for Children and Technology and investigated the potential impact on student performance when the resources available through PBS LearningMedia were integrated into existing curriculum. 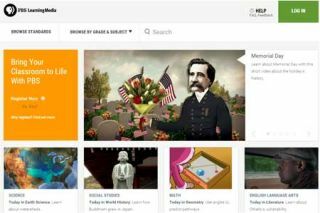 There are resources across content area and grade levels such as “60-Second Presidents.” These resources appeal to today's social learners providing the ability to interact with content by liking and commenting on various resources. Teachers and students can register at https://account.pbs.org/accounts/openid/login.